Donald E “Bud” Hall, age 84, of Bellefontaine, Ohio passed away at 2:45 A.M. Tuesday, February 12, 2019 at Riverside Methodist Hospital in Columbus, Ohio. He was born in Cable, Ohio January 1, 1935, a son of the late Meffard and Carrie (Perry) Hall. He was also preceded in death by a son, Trell Hall August 11, 1999; a granddaughter, McKenzie Rife March 17, 2012; two brothers, Arnold and Paul Hall and four sisters, Ethel Russell, Elma Roush, Geneva Hess, and Donna Scott. On June 18, 1954, he married Mary Elizabeth Alexander and she survives. He is also survived by their children, Debra (Jim) Rife of Bellefontaine, Bevan (Despina) Hall of Boca Raton, Florida, and Shanel (David) Henry of Bellefontaine; a daughter-in-law, Jennifer Darr of Findlay, Ohio; nine grandchildren, Bene’ Wills, Addie Rife, Logan Rife, Casey Hall, Carson Hall, Morgan Henry, Camden Henry, Jacob Hall and Reiss Hall; five great grandchildren; one sister, Norma Jean Keeran of Urbana, Ohio and many nieces and nephews. Bud worked in the construction field his entire career, often building commercial buildings. As well as being an avid fisherman, he loved the outdoors especially to garden and mowing his yard was well as others. You always knew where he was in the yard because he constantly whistled while he worked. He always talked about how blessed he was to have the family he did and how proud he was of them, especially his grandchildren and great-grandchildren. 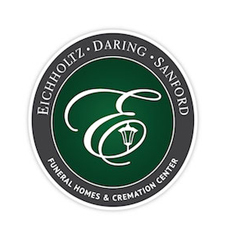 Pastor Julie Fogle will officiate a memorial service at 6:00 P.M. Thursday, February 14, 2019 at the Eichholtz Daring & Sanford Funeral Home & Cremation Center in Bellefontaine. Visitation will be held from 4 to 6 P.M. prior to the memorial service at the funeral home. In lieu of flowers, Bud requested that memorial contributions be made to the Kenzie Rife Scholarship Fund, c/o Bellefontaine City Schools. 820 Ludlow Road, Bellefontaine, Ohio 43311. The scholarship will benefit BHS students who plan to major in music or art.